Seven Days Blogs: Freyne Land: Happy Friday the 13th! 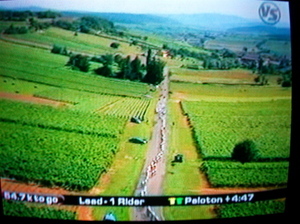 Watching Le Tour de France this morning. Way back in the Freyne Family genes, pre-Irish, pre-Norman, there was a French connection. Speaking of the Freyne Family, got a voice mail yesterday from a a lovely lady in Plymouth, Massachusetts who said she knew my dad. She had recently completed an Irish Studies course through University of Galway that included the book My Kilkenny IRA Days by James Comerford. Would you believe, she informed me, Papa Freyne took the cover photo? The man I knew as a dad, a Peat-Marwick CPA [and Irish Sweepstakes agent in his 50s and 60s], was also a camera bug. Getting that Leica at Shannon Airport in 1960 made a difference in his final chapter. About a decade ago before Seven Days was online, back when the Michael Collins movie came out, I wrote up the story of my father's Dublin Brigade IRA days in 1920-21. A story I grew up with. Days that included the death of his little brother, the uncle I never met, Peter Freyne. Peter was killed in action by the Black & Tans in Dublin in April 1921. Born on a Kilkenny farm in 1901, dear old dad died in New York in 1974. Nice to hear from Ms. Buckley that history lives on! Just to let you know that Peter Freyne's gravestone in Thomastown is in perfect condition and will fwd a photo if requested.